The results of the G-20 economic summit amount to nothing less than the seamless integration of the United States into the European economy. In one month of legislation and one diplomatic meeting, the United States has unilaterally abdicated all the gains for the concept of free markets won by the Reagan administration and surrendered, in toto, to the Western European model of socialism, stagnation and excessive government regulation. Sovereignty is out the window. Without a vote, we are suddenly members of the European Union. Given the dismal record of those nations at creating jobs and sustaining growth, merger with the Europeans is like a partnership with death. At the G-20 meeting, Bush agreed to subject the Securities and Exchange Commission (SEC) and our other regulatory agencies to the supervision of a global entity that would critique its regulatory standards and demand changes if it felt they were necessary. Bush agreed to create a College of Supervisors. According to The Washington Post, it would "examine the books of major financial institutions that operate across national borders so regulators could begin to have a more complete picture of banks' operations." Their scrutiny would extend to hedge funds and to various "exotic" financial instruments. The International Monetary Fund (IMF), a European-dominated operation, would conduct "regular vigorous reviews" of American financial institutions and practices. The European-dominated College of Supervisors would also weigh in on issues like executive compensation and investment practices. There is nothing wrong with the substance of this regulation. Experience is showing it is needed. But it is very wrong to delegate these powers to unelected, international institutions with no political accountability. We have a Securities and Exchange Commission appointed by the president and confirmed by the Senate, both of whom are elected by the American people. It is with the SEC, the Treasury and the Federal Reserve that financial accountability must take place. The European Union achieved this massive subrogation of American sovereignty the way it usually does, by negotiation, gradual bureaucratic encroachment, and without asking the voters if they approve. What's more, Bush appears to have gone down without a fight, saving his debating time for arguing against the protectionism that France's Nicolas Sarkozy was pushing. By giving Bush a seeming victory on a moratorium against protectionism for one year, Sarkozy was able to slip over his massive scheme for taking over the supervision of the U.S. economy. All kinds of political agendas are advancing under the cover of response to the global financial crisis. Where Franklin Roosevelt saved capitalism by regulating it, Bush, to say nothing of Obama, has given the government control over our major financial and insurance institutions. And it isn't even our government! The power has now been transferred to the international community, led by the socialists in the European Union. Will Obama govern from the left? He doesn't have to. George W. Bush has done all the heavy lifting for him. It was under Bush that the government basically took over as the chief stockholder of our financial institutions and under Bush that we ceded our financial controls to the European Union. In doing so, he has done nothing to preserve what differentiates the vibrant American economy from those dying economies in Europe. Why have 80 percent of the jobs that have been created since 1980 in the industrialized world been created in the United States? How has America managed to retain its leading 24 percent share of global manufacturing even in the face of the Chinese surge? How has the U.S. GDP risen so high that it essentially equals that of the European Union, which has 50 percent more population? It has done so by an absence of stifling regulation, a liberation of capital to flow to innovative businesses, low taxes, and by a low level of unionization that has given business the flexibility to grow and prosper. Europe, stagnated by taxation and regulation, has grown by a pittance while we have roared ahead. 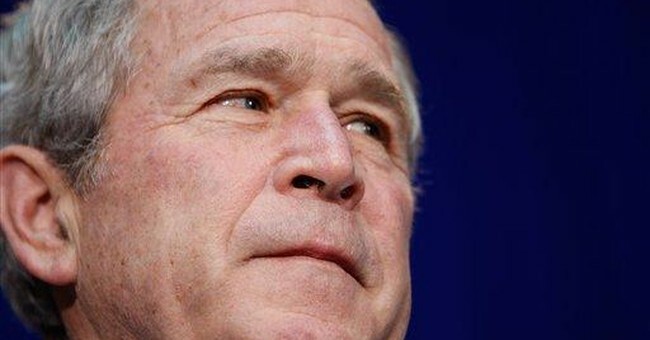 But now Bush -- not Obama -- Bush has given that all up and caved in to European socialists. The Bush legacy? European socialism. Who needs enemies with friends like Bush?